Good morning and happy Sunday. 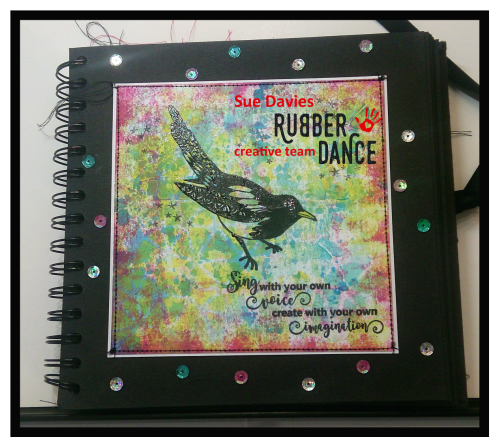 It's my turn to be over on the Rubber Dance blog today with my Simplicity Sunday piece, and here it is! This has been made with the Merry Magpie set and sequins, lots of sequins! There are more details here, on the blog, so I would love to see you over there. I'm linking my Merry Magpie to the Simon Says Stamp Monday challenge, 'all things bright and beautiful' and to Dot's challenge at Ink Art Designs as all the stamps are by Rubber Dance. As always the very generous Bibi is offering free, worldwide P&P on any orders of 15 Euros and above. Simply quote SDFreeShip at the Rubber Dance checkout. Have a lovely day, and thanks very much for looking. All of our stamps can be found here. Fantastic use of many sequins here combined to Merry Magpie, this is just perfect... Your page is beautiful!! Hugs and happy day my friend. this is beautiful, I love your colourful background and all of those lovely sequins. You are brilliant at adhering them, I usually have to chase them around ! Ahhh ... one of my favourite Rubber Dance stamps!!! (plus my footy team is the Magpies lol).